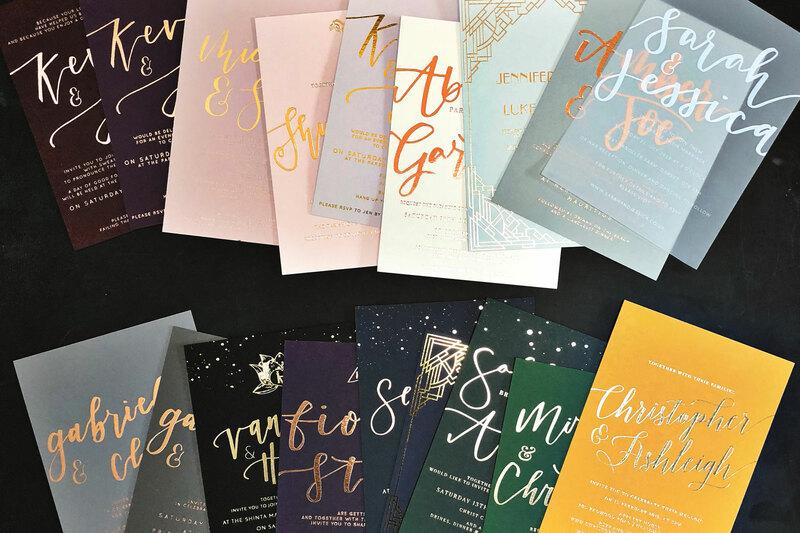 The Golden Letter is an award winning, London based luxury stationery design studio – specialising in hot foil, personalised calligraphy and beautiful tactile wedding stationery. The Studio is a culmination of a 20 year strong love affair with paper goods and stationery. The magic of a beautiful and tactile piece of mail arriving through your letterbox will never be surpassed by anything electronic – there is nothing like setting the tone for your very special day with a gorgeous piece of stationery. Customisable invitations with calligraphy bespoke for you and colours entirely designed around your wedding day – we like to think of our invitations as bespoke without the cost. Want something completely original, we can design something entirely for you. Zoe exceeded our expectations, both with the design and price, she nailed our brief and really listened to us. The design came back really quickly once we had sent over our inspiration and details. She was also really great at working within our budget and giving us he most for our money, I couldn’t recommend her more! Thank you Zoe!!!! Zoe offers the most brilliant stationary – in my case, bespoke. She completely understood what I wanted and ran with it. She suggested little things that I would never have thought of but which made all the stationary that big more stunning. Everything is so very professional but easy, and above all, friendly. The amount of compliments we’ve had about our wedding stationary is amazing. I could not advocate using The Golden Letter enough! Zoe takes great pride in her work and aims to deliver exactly what her clients have in mind. She is able to offer some fantastic creative ideas that allow you to get extremely excited to see the finished product! Our stationery was absolutely spot on and has set the whole theme for our wedding. The comments I have received on the invitations from guests has been overwhelming and a real testament to her hard work and dedication to the work that she does.